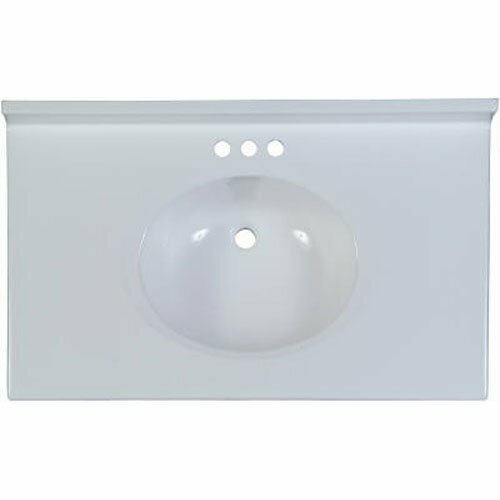 31 inch x 22", solid white, vanity top, with an oval bowl with & 3 inch backsplash, bowl size: 16-1/2 inch x 13 inch x 6-1/4", fits 30 inch x 21 inch cabinet, high luster gloss gel coat finish, resistant to thermal cracking, Cigarette burns & bathroom chemicals, lifetime limited warranty, view pack carton. The product is manufactured in United States. Easy installation and easy handling. View More In Bathroom Sink Vanities & Accessories. If you have any questions about this product by Imperial Marble, contact us by completing and submitting the form below. If you are looking for a specif part number, please include it with your message. PREMIER BATHROOM VANITIES & CABINETS 2474663 Bathroom Vanity Top With Center Recessed Bowl, Cultured Granite, Sandy Beach Matte, 22X31"